The club honors the matriarch of the Latino family, the Abuelita, and her symbol of strength, discipline and love with its on-field persona for this special series of events. The chancla has long been symbolic of the Abuelita as she maintains the structure and order of la familia. I love the bright colors of the Flying Chanclas with the bright blue, pink and yellow. The hat is popping and is a 70s styled pinwheel, with the central panel being white followed by the sides and back being that bright blue. The Flying chanclas hat should be far more comfortable versus the dark navy and black hats that the Missions typically wear—I had to order one (in spite of the hefty price tag) to sport during Fiesta! 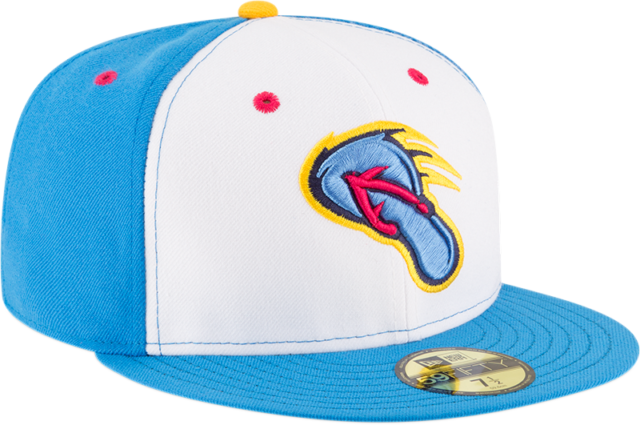 Minor league baseball has always been known for having silly promotions and name-swapping (the Fresno Grizzlies once became the Fresno Tacos for a few games) and I love what the Missions did with the Chanclas! Be sure to catch our Flying Chanclas in action for the first time on Saturday May 5th (the combo of Cinco de Mayo and San Antonio’s official 300th birthday) at The Wolfe as they take on the Corpus Christi Raspas (the name that the hooks will temporarily go by for the Copa de la Diversión)!